The Study Corner Desk is a compact practical design that fits in any corner to provide a large workspace with a small footprint. 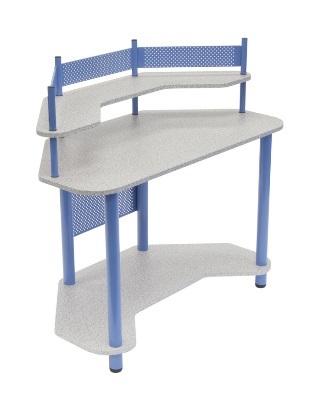 This efficient workstation is perfect for a variety of needs, from computer center to homework and crafting. It features a spacious lower shelf along with a 46"W x 23.5" main work surface. Furthermore, the top shelf is perfect for additional supplies or a computer monitor. Available in a variety of colors fit for any age.